Today's post is all about how we approached the budget to our wedding, following on from my posts about our outfits, and all of the wedding details. When you read in magazines or on blogs how much someone spent on their wedding, that figure is pretty meaningless unless you know what the money actually bought. You need to know how many people attended, how much food and drink they were supplied with, whether it was held in a Chateau or on board a private yacht, or in their parents' back garden. I did get a little annoyed at reading things like "I did my wedding for £1,000!" and then finding out they invited only 10 people and made them all buy their own meals. There's nothing wrong with that - you can do whatever you like - but it's just that headlines like that can be a bit misleading unless you read all of the small print and can lead to unrealistic expectations. When you say 'wedding', people immediately conjure up images of horse-drawn carriages, fairytale dresses and a party on a Gatsby-scale. A generation or two ago it would have been getting hitched in your Sunday best and heading to the local pub for a bit of cake and a few drinks. Oh wow these can be expensive! We saved. I quite like the smart printed ones, and am not a fan of the sort of rustic hand-made one (which also seem to take forever to put together - I am not that patient). 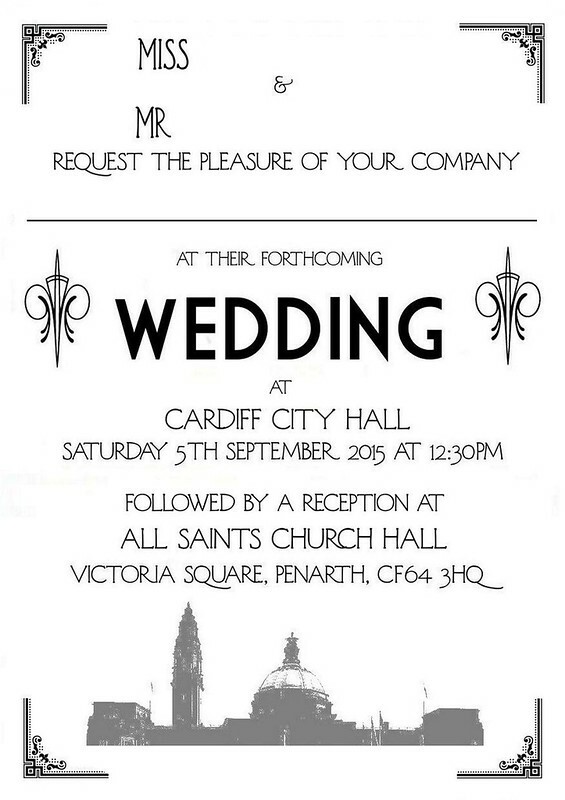 I designed the invitations myself - I had to learn very quickly to learn how to use the art software that they had on the computers in work. A week's worth of lunch hours spent downloading fonts, adjusting text and getting nice decorative bits, and we were ready to send them off to the printers. We got double-sided postcards printed from Vistaprint (£50) and I bought envelopes off Ebay (£5). We saved. 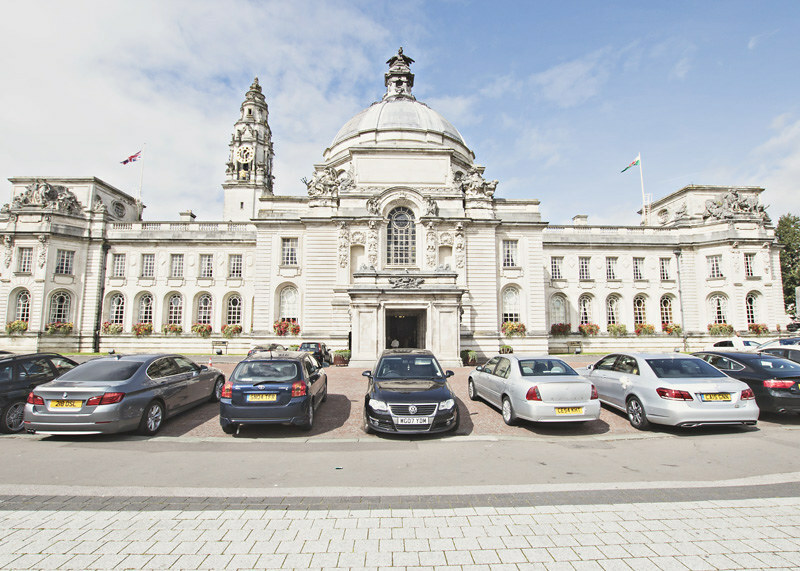 Getting married in City Hall, that amazing impressive building, is the cheapest option for those wanting a non-religious wedding in Cardiff. Cheaper than any hotel or other 'registered' premise. 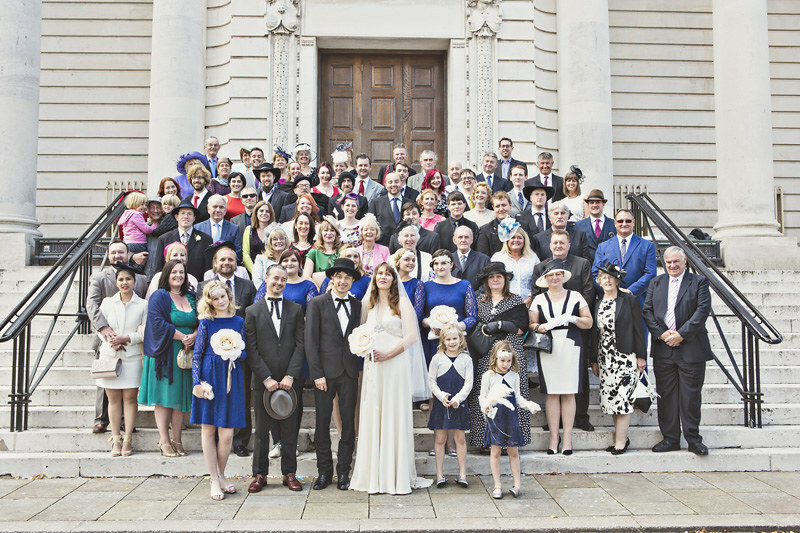 An incredible Edwardian building, with a gorgeous ceremony room. 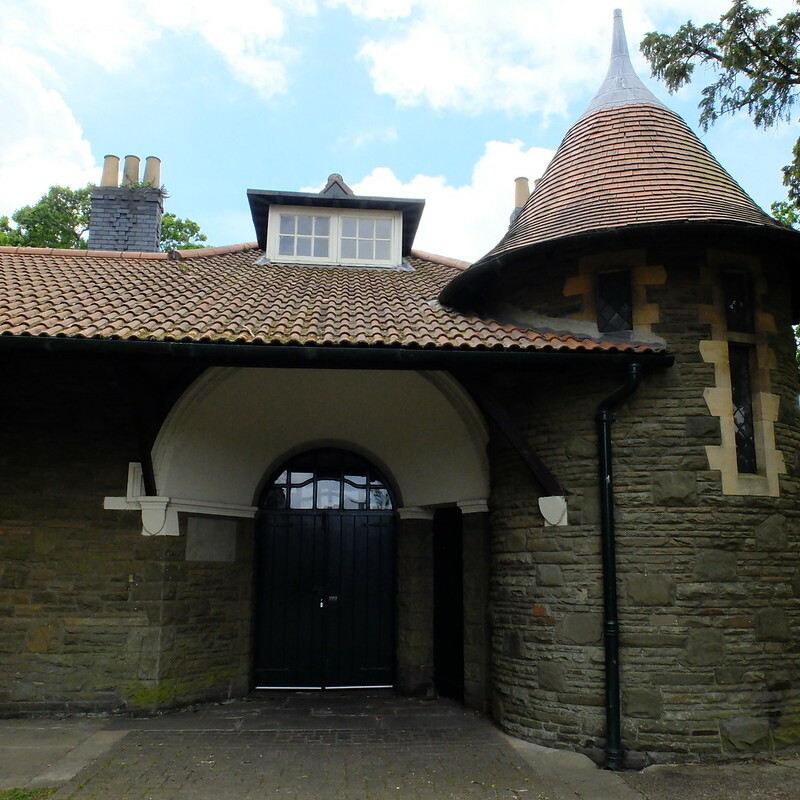 Yours for just £269 for the St Davids room on a Saturday, including the notices of marriage. It's about £100 cheaper to get married in a church, but we're not religious and churches do expect a sizeable donation if you're to get married in one, so be sure to factor that in. 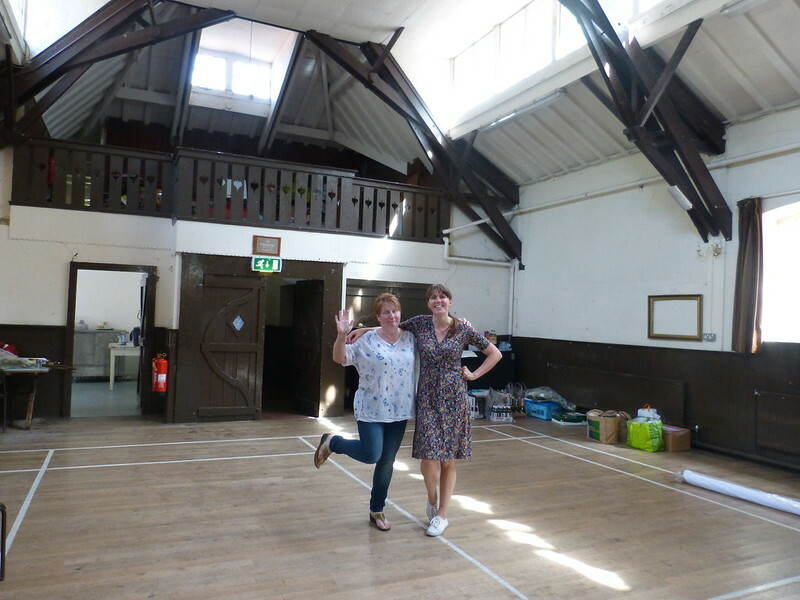 As for the reception venue, All Saints Church Hall in Penarth is a little shabby around the edges, with no proper kitchen facilities etc., so that cost us £270 for one night's hire. You might find more up-to-date halls charge more. We wanted to hire a hall or similar, as we weren't happy with the prescriptive nature of a lot of hotel venues, where you are obliged to use specific suppliers, or get charged lots of additional extras - silly things like "You want to have a mic for the speeches? An extra £90 please." No thank you. We splurged, spending half of the total budget on food and drinks for our guests. It was really important to us to offer our guests a good sit-down meal, with some top-notch food. 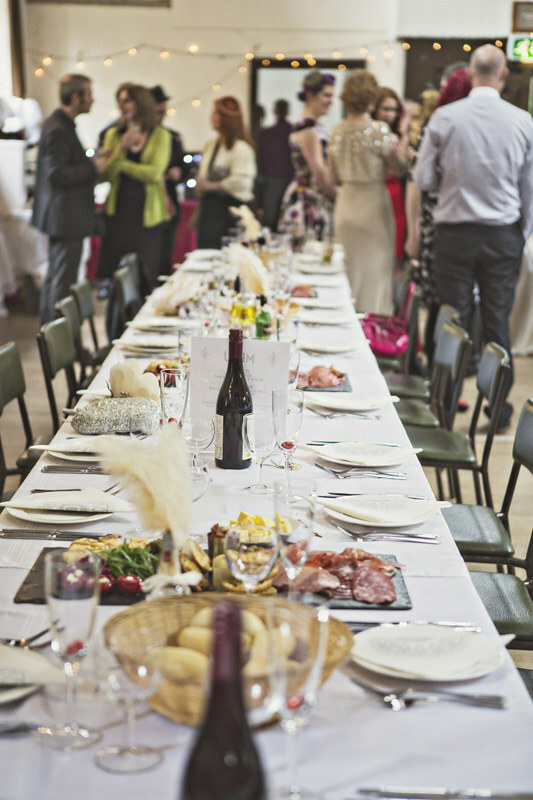 It's costly for people to attend weddings, in terms of travel, outfits and such, and we wanted to make sure that our guests were very well fed. We looked at cheaper options such as hog roasts, bring-a-dish (a Health and Safety nightmare waiting to happen...), buffets and more, but we weren't enthusiastic about any of them. We only approached two catering companies - one big and one small - and were sorely disappointed with the big one, which was quoting us £10 per head more than the small company for the same thing, and also wouldn't supply some of the services we required such as a self-serve tea and coffee station, because "it would reflect badly" on them. Seriously?! 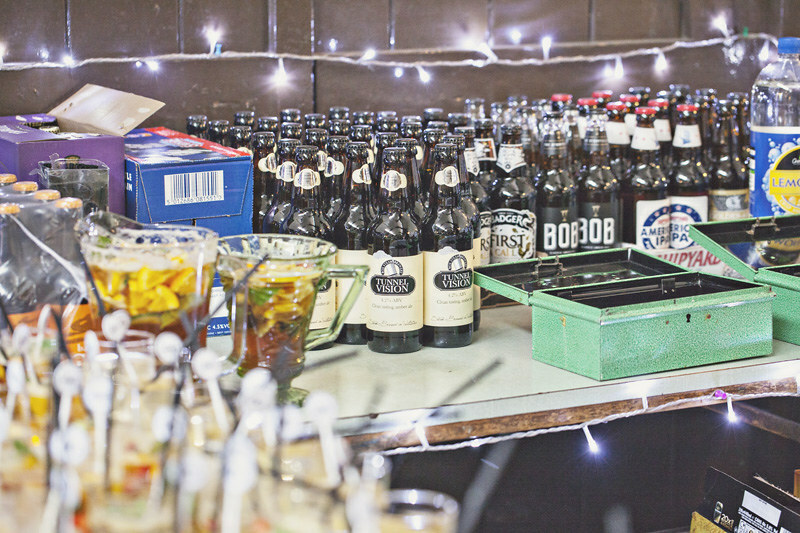 It was a very quick decision to use Fresh Food Events - I can't recommend them highly enough! They really do cater for you as an individual rather than just coming up with generic wedding fare. Lovely food, lovely people. They supplied all crockery and cutlery. I bought tablecloths as it was cheaper than hiring, and bought nice quality paper napkins from Home Bargains for 20% of the usual retail price. I also bought some lovely Lindt chocolates in bulk and put these on the tables. We saved. For the 'welcome drink' for our guests we decided on Pimms. We stocked up on Pimms at Asda when it was on offer, and bought lots of lemonade to go with it. The caterers charged us a small fee to make up the Pimms and add in a bit of chopped fruit. I bought straws and personalised stirrers from Ebay (£4 and £12 respectively). As for the table wine, we waited until there was a 'wine festival' on at Tesco for 25% off, and filled our trolleys with wine that was already half price. It meant we could choose a really nice Pinot Noir and a good Sauvignon Blanc to put out on the tables, rather than the cheapest plonk that would be available in a hotel venue. Similarly we waited for offers to stock up on prosecco for the toasts. (That was a bit difficult having so much prosecco in the house, as I kept drinking it and had to buy more to replace it...) We also put on a cash bar for the night, which meant we could keep our prices much lower than they would be in a hotel. We got a licence, and hired a lovely lady to be our barmaid, and stocked lots of good ales, wines, a few good single malts and so forth. Glass hire is free from most major supermarkets, with a deposit, and it doesn't cost much to supply a few extras such as ice, lemons etc. We saved. 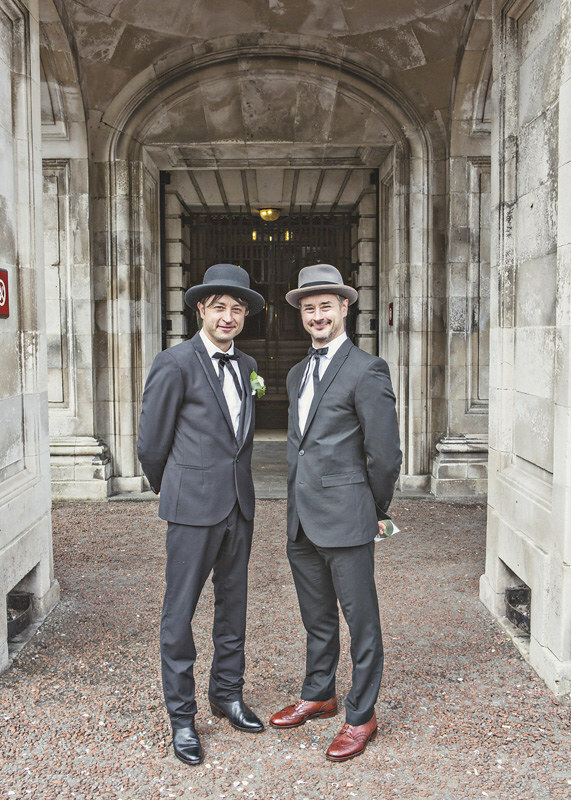 The Groom wore a Topshop suit from the car boot sale, that he snagged for just £2.50. The vintage cowboy boots were also from the car boot sale (£1! ), and I'd bought him the Kentucky tie as a gift. The vintage hat, from Whipple & Co,, was bought from a local antiques shop (£25). The shirt was a Next one (£1, car boot sale), and the waistcoat was from a charity shop for £5. Total outfit cost: £34.50. And the bride wore...a dress off Ebay! I know a bride wearing second-hand can incite strong feelings, but I think it's quite a vintagey thing to do really - women would have passed a dress down the family, because it's such an expensive thing to buy. Unfortunately I didn't quite fancy my mother's 1970s Princess Leia number (sorry Mum!). I wasn't able to get a high-street dress (BHS and Monsoon would have been my top picks, they have some really fab vintagey styles), as they weren't long enough on my tall frame, and I really wasn't taken with any new dresses in my meagre £300 budget - all too samey, corset top, slightly poofy bottom - so I decided very quickly that I'd have to get a second-hand dress. I love Jenny Packham's vintage inspired designs, but at £2,000-£4,000 per dress, they were so incredibly out of reach. A quick Ebay search though, and there was the perfect dress, at just £296 including postage, saving over £2000 off what it would have cost from a boutique. Even a brand-new dress from a boutique will need alterations. I am lucky to have a very dear friend who is handy with the sewing machine, and I enlisted her help to hem the dress, and to alter the halter-strap, the only two things needed. She did such a wonderful job! She also very kindly helped my husband take in his waistcoat. I personally sewed in some bra cups to my dress, cut from a cheap bra as it was cheaper than buying bra cups separately, and also repaired the beading. Some beads had come loose, so I securely fastened them. As for the missing beads? You can buy replacement Jenny Packham beads for about £50 for a very teeny sachet. I thought that was a bit steep, so I went to Primark and bought some beaded headbands, and just used the beads from those. They look exactly the same. I loved the star headband I found on Ebay from Bellamour Tiara (£37.95) and bought some veiling off Ebay (£15.06 for far more than needed) so that my talented friend could attach it. I was basically recreating a designer veil I'd seen that was around £200. I splurged on the shoes. I didn't want a big heel as I was going to be on my feet all day, but I don't like the way flats make my posture slump a bit. The only small heels I could find were from Rachel Simpson, but I waited until I got a 20% off code through a wedding magazine's twitter feed to make them £128 instead of £160. My bag was an original vintage one borrowed from a friend. Finding a pair of knickers was a nightmare, but in the end What Katie Did came through for me with their very deco looking French knickers (£35.50). I also bought all the sewing supplies my friend needed - ivory thread, silk pins and so on - so I think realistically in total my outfit came to £550. 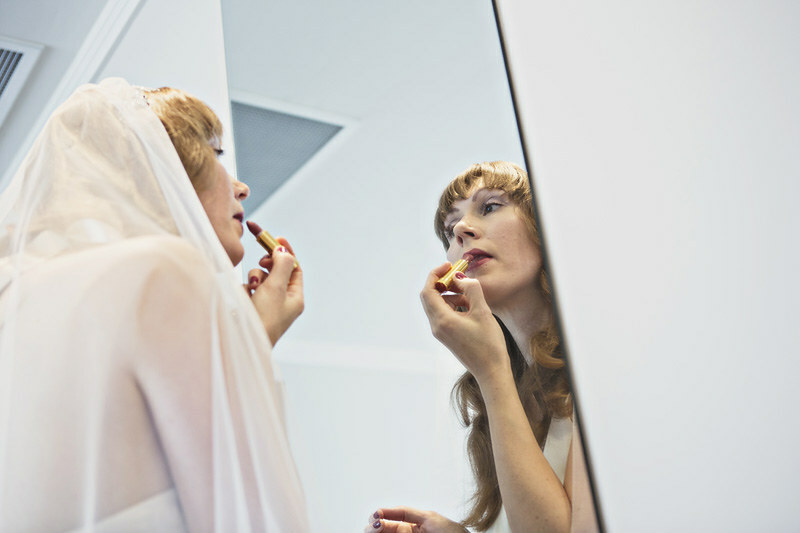 That's still a lot less than the average £1677 that brides spend on their outfit (according to Brides magazine). And here's a photo that captures why I think spending that much is ridiculous - your outfit is going to get ruined. After the meal, one of my sisters threw a cup of coffee over me. The train dragged on the floor all afternoon. Just look at the state of the dress and shoes the next morning!! I did my own hair and make-up on the morning of the wedding. This wasn't just money-saving, I genuinely don't like people faffing around me when I'm nervous! I used a Besame lipstick I already owned (Dusty Rose), but bought a new foundation (L'Oreal dupe of a Giorgio Armani one) and eyeshadow from Mac. They're all products I have continued to use, they weren't bought as a 'one-off'. My bridesmaids all did their own hair and make-up, they're all young and trendy anyway and used to doing their own make-up, they looked great. As for the bridesmaids, I didn't want them in long dresses, pastel dresses or strapless dresses. The groom has strong feelings about fashion, and he didn't want them in asymmetric dresses, mis-matched dresses or black dresses. (I was a bit gutted about the black actually, but our wedding was at lunchtime not in the evening, so maybe he was right about that.) My first attempt at choosing a bridesmaid dress entailed a lace wine-coloured midi dress from Next. Bridesmaid #2 hated it. The second attempt was a coral 1930's style maxi dress from Very. Bridesmaid #3 hated it. Third time lucky, a cobalt blue lace skater dress from Very. 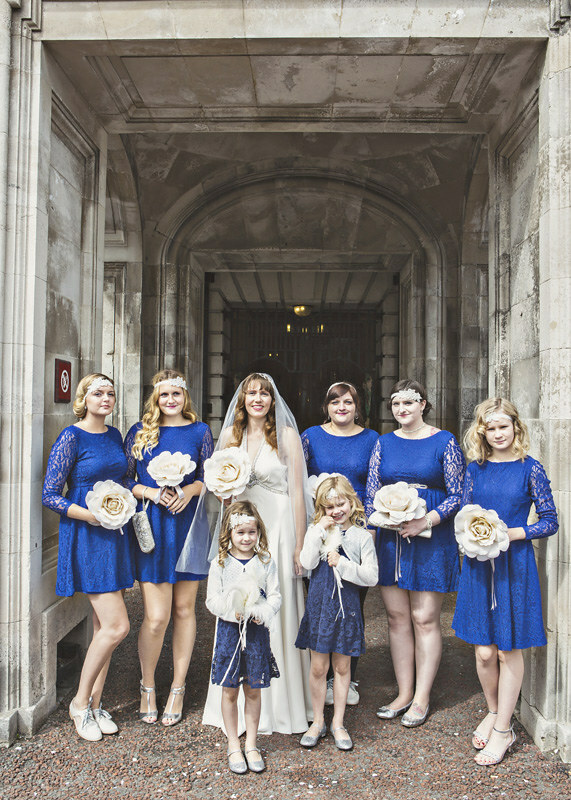 If you're not in the UK, you need to understand that unlike in the USA, bridesmaids do not pay for their own dresses, that's covered by the bride and groom. So, please don't tell my bridesmaids, but their dresses from Very were actually from the outlet on Ebay, and cost £6.99 each!! I could have just told them to wear their own, but they are all different shapes and sizes and have very different tastes. I found flower girl dresses in a complementary style from Asda of all places. The Gatsby style hairbands were off Ebay, from a UK based lady who makes them herself to order, I think they were only about £3 each. We saved. We didn't actually have any fresh flowers in the end. We made an attempt to grow our own, my Dad planted some bulbs I gave him the year before, but I didn't realise the flowers needed a few years to grow to a decent size! They were like little twigs. Whoops. Plan B: fake flowers for the bouquets, and feathers for the table decorations. 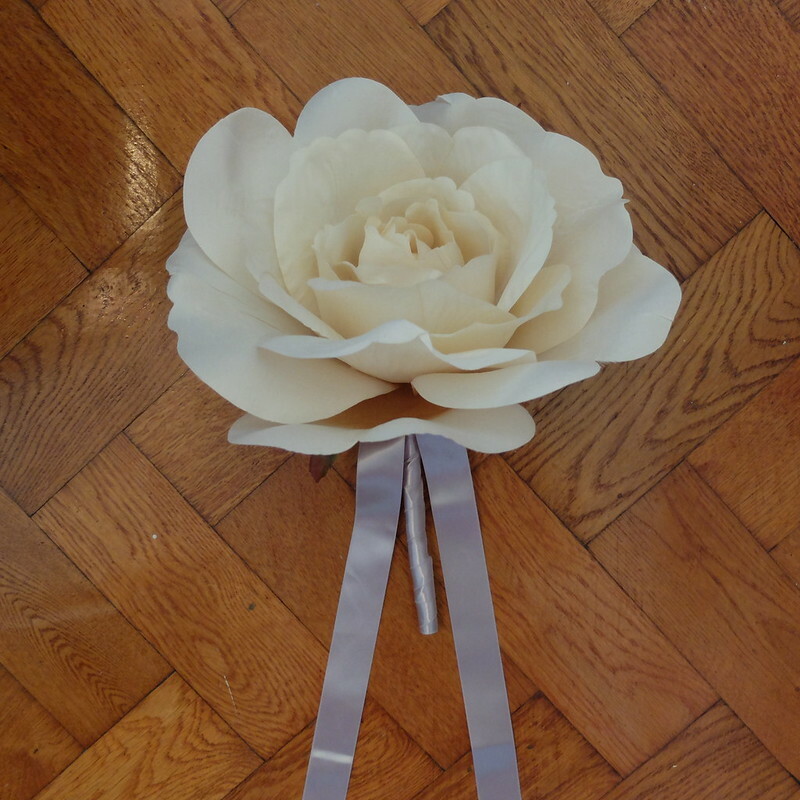 I was very inspired by the oversized 'Glamelia' composite bouquets of the 1940s, where extra petals would be glued around a flower to make a giant flower. I happened upon some giant fake Roses in Home Bargains, and knew they would make perfect bouquets. I might do a tutorial of how I made them at a later date, but they were just £2.99 each and I then spent £2 on ribbon at the car boot sale. 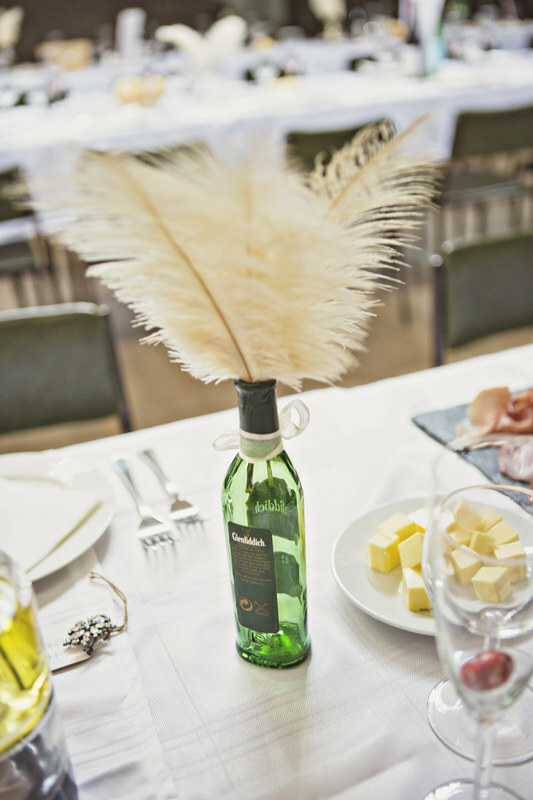 As for the feathers, £14 bought enough to make feather bouquets for the flower girls, and the remainder went into mini whisky bottle vases on the tables. A friend in my work gave me a length of swag material that she'd bought for a party and never used, and my sister-in-law draped it artfully to cover church noticeboards. 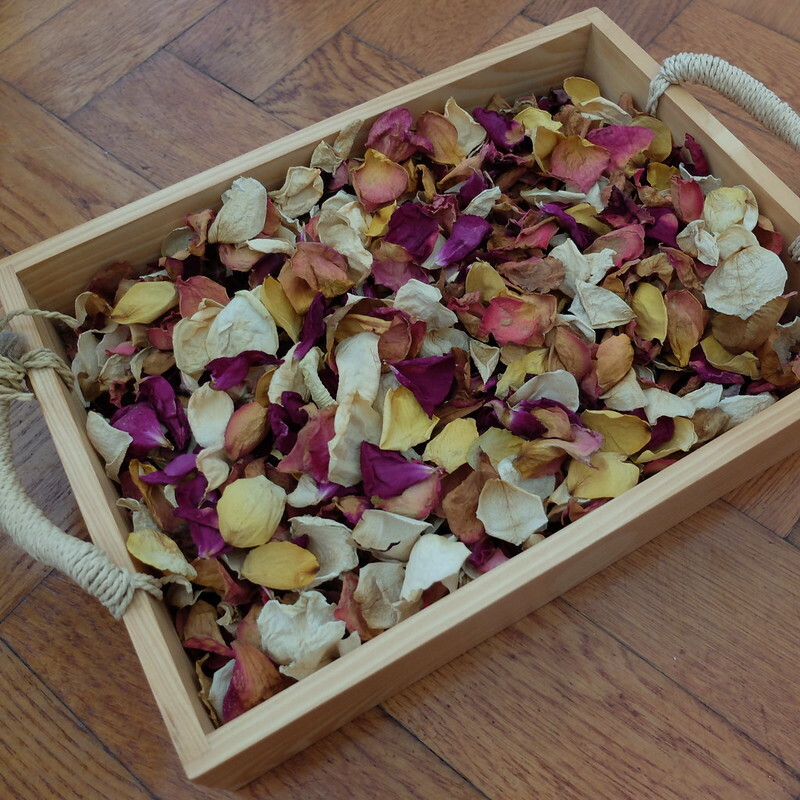 I dried a load of rose petals from our garden myself over many, many months. I initially thought they'd be good as confetti, but then read that City Hall doesn't allow confetti, so I decided to put the petals in vases, and used ribbon and Deco dress clips to finish them off. I collected other decorations from charity shops and car boot sales - the Mr & Mrs letters, photo frames, fairy lights etc. I made a giant heart out of fairy lights and the stems I'd cut off the giant roses. A length of lace and some red velvet formed the backdrop on the stage behind top table, and the leftover giant roses were wrapped around the bases of the speakers. 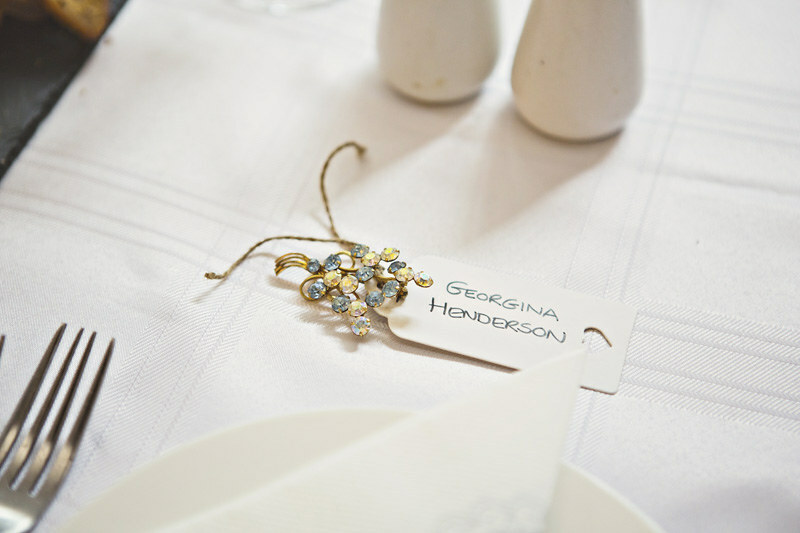 I've already mentioned that place-cards were luggage tags ordered off Ebay; I wrote the names on by hand, and attached a brooch to each of the ladies' place-cards so they would have a little sparkly memento of the day. Yes, it was very hard surrendering 40 gorgeous brooches! We saved. The lovely vintage ones were about £400 and up, so I just went with a local taxi for £120, who provided a silver Mercedes with ribbons and no taxi logos. Some of you are probably thinking "Well if you're paying £120, it's only £280 more for a really nice car...". That attitude will quickly get you into trouble when planning a wedding! The money saved actually went towards one of the most spectacular hotel rooms I've ever stayed in on honeymoon, at the Hotel Ateneo Seville. We saved, massively. I have to admit that I WON our photographer!! Alternative wedding blog Misfit Weddings was running a contest, and I won the top prize, to have the lovely Lorna Lovecraft shoot our wedding - a package worth £1000! Lorna was lovely, and we were really pleased with the images she took. I entered many, many competitions in the run up to the wedding, and I'm really quite pleased that some of that time investment paid off. We splurged on a live rockabilly band and a DJ. A cheaper option would have been an Ipod with a pre-selected track list, but that would be sacrilege for a musician! The groom was determined not to have any 'wedding cheese', and we went for a soundtrack including Big Band, rock 'n roll, soul and the groom's own songs. We saved - this was a wedding gift from one of my sisters, as she has a very talented cake-making neighbour! 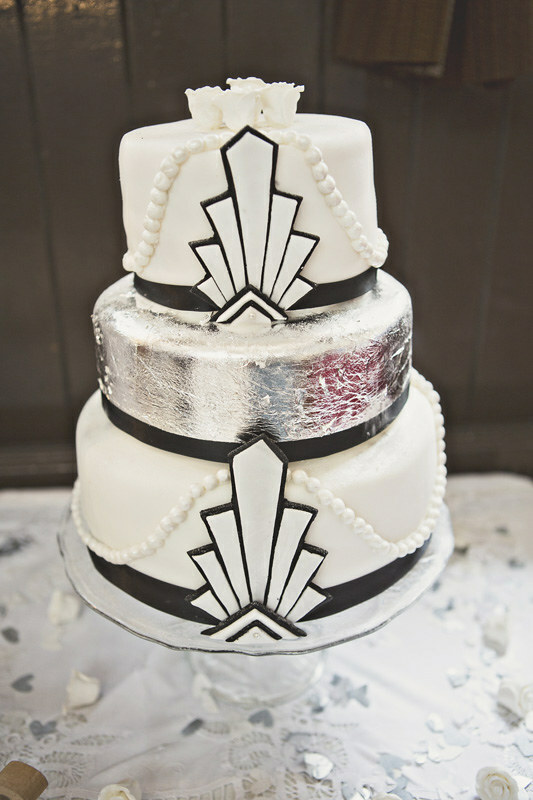 What a fantastic job she did at creating this Deco masterpiece. This is the bit that money can't buy - the sheer hard work of your nearest and dearest in helping you pull off this one day. There is no way we could have achieved what we did without the help of our friends and family. Reading through all of the details so far, you'll have noticed that our loved ones helped us hem outfits, laminate menus and bake cakes. But that's just the tip of the iceberg. For a good five hours, my sister-in-law helped me set up tables, ironed tablecloths, and arrange swags, before giving me a lift to my hotel for the night. What a trooper! My parents also helped out with tables and chairs, as did my mother-in-law (and more ironing..! ), and then my sister and one of her daughters arrived to set up the cake, and somehow ended up helping out with decorations too. Then my younger brother turned up, and ended up helping lay out the place-cards, napkins and cutlery. My husband was mainly occupied with setting up lighting and the sound system, before getting the bar set up. We also took delivery of the tower of cheese and had to get that in the fridge. My husband didn't leave for several hours after I left, and he had to go to the hall first thing the next morning to let the caterers in. 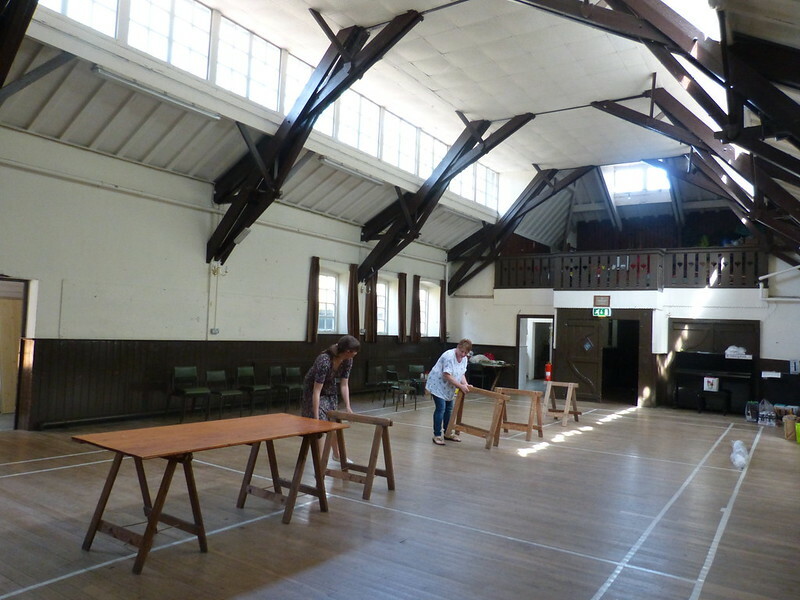 On the day of the wedding, after our guests had left, there was a lot of clearing up to be done, as the hall was booked for activities the next day. We had to move all of our equipment into a side room, to pick up later in the day. Our guests were amazing, but my new husband and I still didn't leave until 2am! The next day, we were back at half eleven to sort things out, but it was 3 o'clock by the time the cars were packed, rubbish had been taken to the tip, hired glasses returned, and the hall left clean and tidy. We were utterly exhausted. I think I need to stress again just how much hard work - hefting heavy things, cleaning things, and organisation - is required when you DIY a wedding to the level we did. If you have more money than time, for goodness sakes get someone in to do all that for you!! As for the bloodshed - I dropped a heavy trestle table on my shin the day before. I still bear the scar. Thank goodness I was wearing a long dress the next day! So, the most important message in this entire post is the huge THANK YOU to all of our wonderful friends and family who helped wash up glasses, sweep floors, carry chairs and tables, iron tablecloths, hang swags, drape fairy lights, arrange place-cards, and everything else that was needed to pull it off. I'm not going to give you a final figure, I don't want anyone to get upset about their view of our budget and whether they think it was too much, or not enough, or that they would have spent things differently. People will disagree immensely on this topic, because how you spend money is a very personal thing. If you're planning your own wedding and genuinely want to know I'll happily answer queries via email. Otherwise, all you need to know is that we lopped 75% off the average wedding cost, and did it our way from start to finish. Please bear in mind that any prices quoted in this article were what was paid in 2015 - of course prices will go up! Kind of sums up the phrase 'labour of love'! But so worth it for something so unique and personal. I got a taxi to my wedding too - we did everything in one venue, so it seemed daft to spend money on a car I'd sit in for 10 minutes and none of my guests would see. It's funny - the wedding industry and the funeral industry are much a like in that they like to take advantage of people during what is an emotional and stressful time by tacking on obscene fees for very basic and simple things. 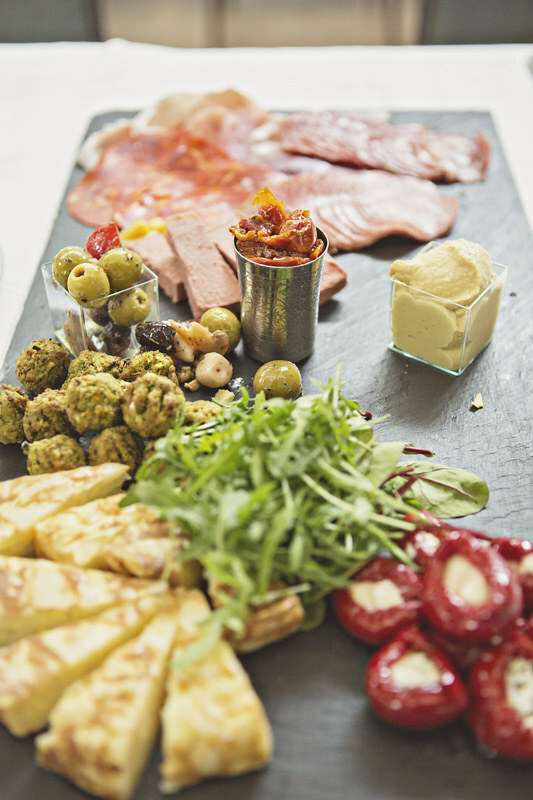 The food at your wedding looks fantastic, your guests were very lucky! Wedding invitations are expensive - but my mother in law was hell bent on outdoing her sister who's son got married the year before us and had really bad wedding invitations (that all of the relatives still laugh about today) so we had no choice in ours ahahaha. Like you I also entered competitions to save money on our wedding, and my hens do/bridal shower was a competition package that I had won for everyone to have free food and bubbly. I'm just so impressed with your efforts here though. It looks like such a fun day and the fact that you cut corners on costs in some areas doesn't seem to have impacted it in any negative way that I can see. In lots of ways it made it way better! And for the record, I am determined to have a band if we get married too - and I already know it's going to cost a LOT!!! My wedding was done on a budget too with my dad driving me to the venue, three chocolate cakes from Waitrose decorated with matching flowers to the rest of the wedding, my father-in-law doing the photography and the wine and champagne being picked up at a bargain price by my mum's boss at a hypermarket in France. He also donated the printing, card and envelopes for the invitations as he is a professional printer. 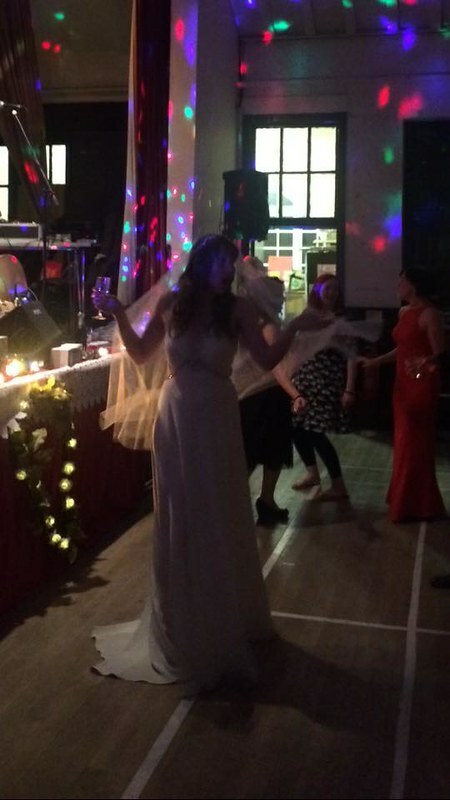 My dress cost me just £75 because I worked in the bridal wear industry at the time and got all of the silk at cost price, then designed and made it myself after hours. I absolutely loved organising it and pulling it all together, as Mim said it was a labour of love. It's great to see a wedding with a lower budget that isn't totally DIY, there seems to be nothing in between, and I'm not creative so it was never any use to me to see how people could create all this amazing suff themselves. It's crazy how quickly things add up, just reading this I kept thinking 'oh yeah I forgot about that' and that's where the money creeps in, it's just a little thing so you don't count it, but there are so many little things! I love how great you are at car boot finds, and that it played into your wedding, perfect! It's scary that as soon as you mention the word Wedding, prices go through the roof! This post makes me wonder what will become of the wedding as time goes on. Probably nothing. But I've noticed there has been increasing trends for couples to go the DIY routes or to scale back rather than scale forward with weddings over the last several years. Not to mention here in the states there has been increasing trends for couples to wait longer if they ever decide at all to get married. You did a lovely job on your wedding and I love seeing your pics! So nice to hear how you produced a beautiful wedding on a budget that works! When I got married, I really paid attention to my budget and can see how it can easily got out of control. How lucky that you won the photography - that to me was one of the more important things since it's your forever memories. This was fascinating to read! I worked on a project for a client last year to do with the costs of weddings, so I thought and read a lot about it then and came across a lot of similar things to you - people saying their wedding was cheap, but it only being a small one for example. 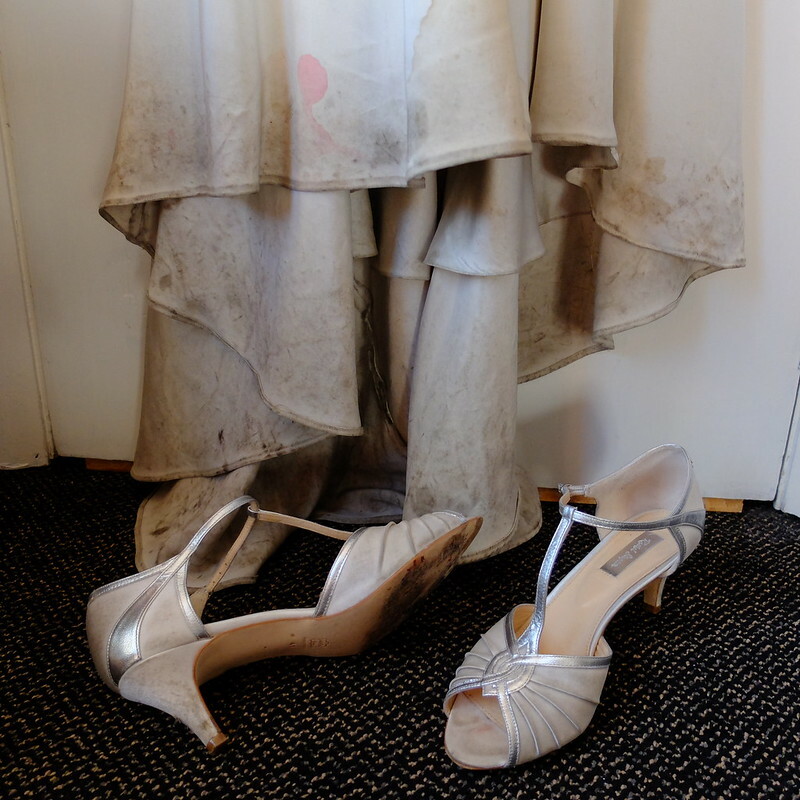 I really love the idea of finding your wedding dress second hand on eBay - one of my friend's sisters did this and it was so beautiful, you couldn't even tell it was second hand! I feel like wedding dresses are a bit like cars - as soon as you've bought it, the value must drop massively! And as you proved, they do just get ruined at the end of the night. It looked like you had the most amazing day though, and to get it at 75% of the usual average cost just makes it all the more amazing! I'm blown away with the effort you put into every detail. You kept in control of the entire day and got exactly what you wanted. It just proves that anything is possible if you put your mind to it! Even though I have been married for a long time and not planning a wedding I still really enjoyed reading about your wedding. I loved to read where you saved and splurged. I love how amazing the whole wedding party looked and I can't belive that you got such a good deal on your dress and your bridesmaids dresses. I always splurge on shoes as they fit better so I am happy you did. How cool that you won your photography package. That really is an incredible savings as well. So interesting that the small catering company charged so much less than the big company did for doing so much more. Glad that you got a few quotes. You really did an amazing job and I am so happy you shared the journey! This was such an interesting read! I love the one of your only big splurges was the food and drink - it sounds like you really had your priorities in order! And lucky you, winning a wedding photographer. I know that can be quite expensive, but that's one thing that I think would be worth spending a bit more on. It's one of the biggest days of your life, and you want those photos to look back on in the years to come.